I have been gathering many photographs of old circuses and zoo's, well the ones that don't make me wince at how badly everything is being treated. Some of the animals that ended up in zoos are incredible and I would love to know more about their stories. 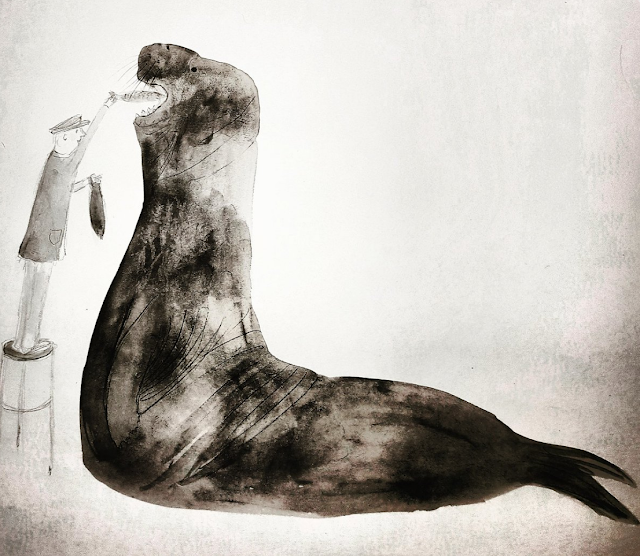 Goliath the elephant seal is one of those characters. Now I don't quite know what I am going to say here or what if anything is going to change. This blog was ten years old last week, an incredible thing for a dyslexic artist to achieve. Though I do pity the many skilled editors, grammar police and spelling kings and queens that have to suffer my mistakes and I am sorry that I make them. 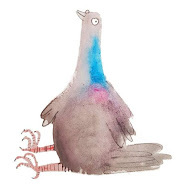 Blogging every day has been something that I have insisted on for a number of years now, but I am finding it quite stressful now, mainly to find the content for a daily update, especially after long days at work and trying to do my illustration work. So there may be subtle or unsubtle changes ahead, I am not sure, but whatever happens thank you for your ongoing support and general wonderfulness. Hazel : e good to yourself! I think you've earned the right to take a break, turn a corner, go dark and follow your path/s. Its the right thing to do. Of course I will miss the Art Plant but you have given me so much inspiration over the years. There's so much to return to and savor. Most of all, I savor your achievement and those that lie in your future. 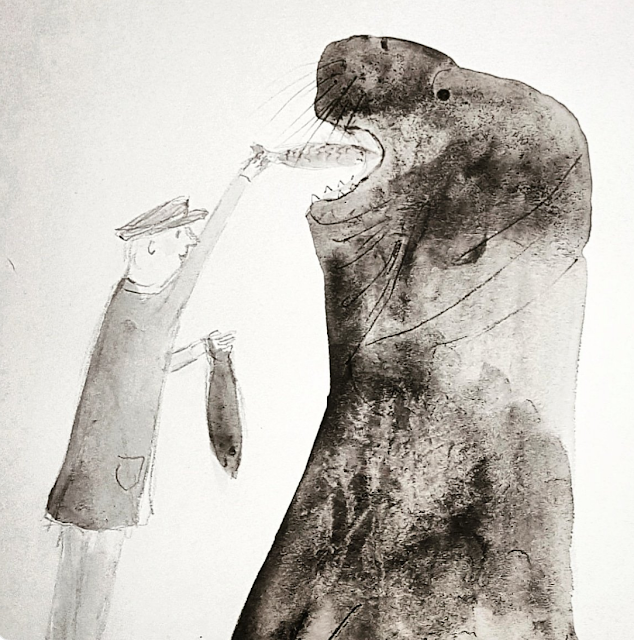 And I love this relationship between the sea lion and his minder. Regarding that, I'm reading "The One and Only Ivan." It might be relevant. Hazel, I really love your work so much. If you posted your or other's work once a week or even once a month, I'd be happy. Follow your heart and your gut, my friend. You are so talented.